Professor Frans Van de Werf, Herestraat 49, B-3000 Leuven, Belgium. Standard fibrinolytic regimens suffer from several limitations. They induce recanalization slowly (45 to 60 min after onset of treatment generally) and they induce complete patency (TIMI grade 3 fl ow) in only 55 to 60% of patients treated and re-occlusion attributable to prothrombotic side effects of the lytic1 was common but occurs less frequently with the new antithrombotic co-therapies. Bleeding complications, especially intracranial hemorrhages, continue to be a concern, especially in elderly patients. Already in the fi rst studies performed with primary PCI benefits in terms of patency, residual left ventricular function and risk of hemorrhagic stroke or other bleeding complications became evident2,3. There is no doubt that timely performance of PCI by an experienced team is superior to in-hospital fi brinolytic therapy as clearly shown in the meta-analysis by Keeley et al. published in 20034, though limitations exist. PCI cannot be offered to all patients. Signifi cant delays may occur. Although no prospective studies have been performed to prove it, registry-type studies and meta-analyses suggest that primary PCI may not exhibit a mortality advantage when performed more than 120 min after first medical contact5,6. In some patients (those presenting early with a large infarct and a low bleeding risk) this maximum acceptable delay may be significantly shorter. In order to minimize the disadvantage of treatment delay, ‘facilitated PCI’ has been investigated. Facilitated PCI is defined as a pharmacologic reperfusion treatment delivered prior to an already planned PCI, in order to bridge the PCI-related time delay. The PCI is performed immediately on arrival in the PCI-hospital, irrespective of the result of the lytic treatment. Full-dose lytic therapy, half-dose lytic therapy with a GPIIb/IIIa inhibitor and use of a GPIIb/IIIa inhibitor alone have been tested for this purpose. However, no evidence of a clinical benefi t with the use of these strategies has been obtained7 . In contrast to facilitated PCI, a pharmaco-invasive approach can be defined as a combination of fibrinolytic therapy followed by angiography (with PCI if needed), either immediately when there is evidence of failed fibrinolysis (in most cases to perform rescue PCI) or at a later time point in case of successful fibrinolysis (in order to decide on longterm mechanical or medical therapy). Early in the course of STEMI, the occlusive thrombus is smaller and more amenable to lysis8, in part because of the lack of cross-linking of fibrin. Pre-hospital treatment might therefore be a particularly attractive approach to save time and improve outcomes in patients with STEMI. Whether pre-hospital fibrinolysis in patients with large infarcts presenting early to an ambulance system or a community hospital without a cath lab is at least as effective or even better than transporting the patient to a tertiary care hospital for routine primary PCI has been studied recently in a large prospective trial in almost 2000 STEMI patients, called STREAM (Strategic Reperfusion Early After Myocardial Infarction) 9. The STREAM study showed that a strategy involving early fibrinolysis with bolus tenecteplase and contemporary antithrombotic therapy (aspirin, clopidogrel and enoxaparin) offers similar efficacy as primary PCI in patients with STEMI who present within 3 hours of symptom onset and who could not undergo primary PCI within 1 hour of first medical contact. At 30 days, the combined endpoint of death, shock, reinfarction and stroke was nonsignificantly lower in the pharmaco-invasive arm. In about two thirds of the patients an urgent catheterization could be avoided. The STREAM results are supported by a recent report of the FASTMI (French registry of Acute ST-elevation and non-ST-elevation Myocardial Infarction) study from France in which a lower 5-year mortality was observed with a pharmaco-invasive approach when compared with standard primary PCI10. During the course of the study the dose of tenecteplase was halved in elderly patient because of an excess in bleeding complications. No intracranial bleedings have been observed in the 93 patients treated with this reduced dose. In the planned STREAM-2 study this strategy of a reduced dose of elderly will be compared with standard primary PCI in a population of 600 STEMI patients 70 years of age or older. The establishment of coronary thrombosis as the immediate cause of STEMI and the development of fibrin-specific agents led to an enormous amount of basic and clinical research and elucidation of the now fully embraced paradigm that guides treatment of patients with STEMI, regardless of how recanalization of the infarct-related coronary artery is induced. Consequently, our knowledge of the pathophysiology of an acute coronary occlusion and of the benefit of reperfusion has been enhanced profoundly. The benefits conferred by clot lysis paved the way for utilization of mechanical reperfusion, currently the preferred strategy. Clinical benefits of reperfusion, whether induced pharmacologically or mechanically, together with optimal antithrombotic therapy, cannot be overestimated. 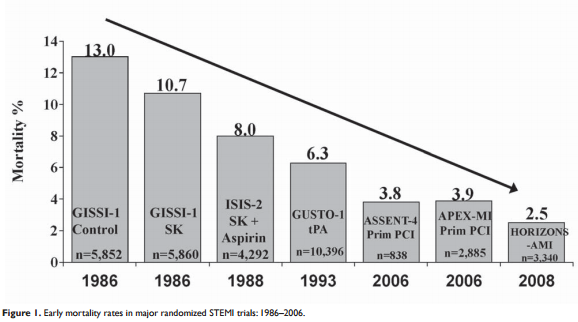 In randomized trials in patients with STEMI a decline in early mortality of >70% has been observed ( Figure 1). Reperfusion therapy has become one of the most successful achievements in modern medicine. Mortality in patients not participating in clinical trials is, however, much higher and pre-hospital mortality has not changed significantly over recent years. More public education and lay resuscitation initiatives might be helpful here. Further improvement in the treatment of patients with STEMI will come mainly from implementation of emergency medical systems in which a network of hospitals with various levels of technology is connected by an efficient ambulance (or helicopter) service. Even with the availability of catheterization laboratories in many of these networks, fibrinolytic therapy remains invaluable for patients in whom PCI cannot be performed expeditiously, especially in those presenting early to an ambulance system or to a community hospital without a catheterization laboratory. A pharmaco-invasive strategy seems to offer an attractive strategy for these patients. Disclosure of conflict of interests: F. Van de Werf received research grants from Boehringer Ingelheim, Merck, Sanofi Aventis and The Medicines Company and speaking fees and honoraria for participating in advisory boards and DSMCs of the above mentioned companies. 1. Topol EJ. Acute myocardial infarction: thrombolysis. Heart 2000;83: 122–126. 2. Zijlstra F, de Boer MJ, Hoorntje JC, Reiffers S, Reiber JH, Suryapranata H. A comparison of immediate coronary angioplasty with intravenous streptokinase in acute myocardial infarction. N Engl J Med 1993;328:680-684. 3. Grines CL, Browne KF, Marco J, Rothbaum D, Stone GW, O’Keefe J, Overlie P, Donohue B, Chelliah N, Timmis GC, Vlietstra RE, Strzelecki M, Puchrowicz-Ochocki S, O’Neill WW. A comparison of immediate angioplasty with thrombolytic therapy for acute myocardial infarction. The Primary Angioplasty in Myocardial Infarction Study Group. N Engl J Med 1993;328:673-679. 4. Keeley EC, Boura JA, Grines CL. Primary angioplasty versus intravenous thrombolytic therapy for acute myocardial infarction: a quantitative review of 23 randomised trials. Lancet 2003;361:13–20. 7. Keeley EC, Boura JA, Grines CL. Comparison of primary and facilitated percutaneous coronary interventions for ST-elevation myocardial infarction: quantitative review of randomised trials. Lancet 2006; 367:579–588. 8. Fox KAA, Robison AK, Knabb RM, Rosamond TL, Sobel BE, Bergmann SR. Prevention of coronary thrombosis with subthrombolytic doses of tissue-type plasminogen activator. Circulation 1985;72:1346–1354. 9. Armstrong PW, Gershlick AH, Goldstein P, Wilcox R, Danays T, Lambert Y, Sulimov V, Rosell Ortiz F, Ostojic M, Welsh RC, Carvalho AC, Nanas J, Arntz HR, Halvorsen S, Huber K, Grajek S, Fresco C, Bluhmki E, Regelin A, Vandenberghe K, Bogaerts K, Van de Werf F; STREAM Investigative Team. Fibrinolysis or primary PCI in ST-segment elevation myocardial infarction. N Engl J Med 2013;368:1379-1387. 10. Danchin N, Puymirat E, Steg PG, Goldstein P, Schiele F, Belle L, Cottin Y, Fajadet J, Khalife K, Coste P, Ferrières J, Simon T; FAST-MI 2005 investigators. Five-Year survival in patients with ST-segment elevation myocardial infarction according to modalities of reperfusion therapy. The French registry on Acute ST-elevation and non-ST-elevation Myocardial Infraction (FAST-MI) 2005 cohort. Circulation 2014;129: 1629-1636.